This morning, I was watching the Festival of Families service in Philadelphia, Pennsylvania, with Pope Frances. Mark Wahlberg was at the podium to introduce Herbert Lusk, famous running back for the Eagles, 1976-1978. On October 9, 1977, Mr. Lusk was the first NFL player to kneel at the end zone after a touchdown and pray. Now pastor Herbert Lusk of the Greater Exodus Baptist Church since 1982, he picked up his Bible and began to read the words of Jesus from the Gospel of Luke, chapter 15, regarding the Prodigal Son. Forgetting that he had just told us that God’s word would be spoken, Mr. Wahlberg instead exalted a football team, above the words of the One True God. Pastor Lusk began to read the Words of Jesus, and by the end of the first sentence, Fox News interrupted the reading of God’s word to break for a commercial. Fox News, chose their commercial interests, above a respect for God and His word. Perhaps it is because I am getting older. Maybe it is due to the examples that I saw in great and Godly men during the early days of my relationship with Jesus, that this sort of behavior concerns me. Thirty years ago, whenever the word of God was being spoken, people stopped what they were saying or doing, and listened. When a prayer began, people paused, removed their hat, and listened. Not so many years ago, people had a genuine honor for God’s word. Even though they may not believe in what was being spoken, they still showed respect for what was being said. It is the word of the Living God. Jesus said that when He returns to earth, will he even find anyone who still has faith? One of the signs that Jesus arrival on earth is close, is a callous disregard for the Word of God and the lack of reverence for the things of God. Certainly, we are at this place today. Some might say that I am over reacting to events that took place on a television show. I am one who watches everything that happens in the world today. I look at what people are doing. I listen to what they are saying. I am watching to see and hear if events that are taking place in the world are lining up with what Jesus said would happen, just prior to His return. For many years now, I have noticed a drastic change in the hearts of people all over the world. People are increasingly, less concerned with God and His word and their lives are reflecting this change. We might think that the name of God is the highest ideal that we should honor. Even today, Jews around the world will not write out the entire name: God. 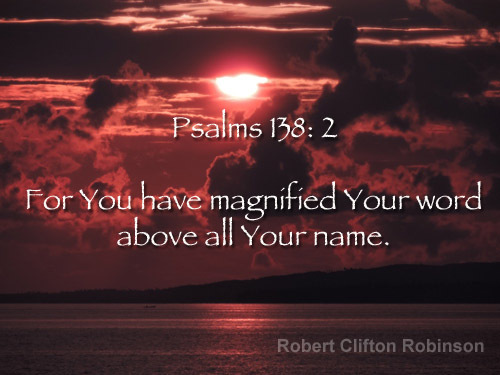 They instead abbreviate it as: G-d.
Psalm 138 describes God and what is most important to Him. He said that His Word is exalted above His Name. It is not a mistake that the longest Psalm is 119, solely devoted to exalting the Word of God. At 176 verses, the entire purpose of Psalm 119 is to exalt and honor the Word of God. The world today has lost its former reverence for God and His word. The days in which we live are filled with a preoccupation with self and the seeking of things that will not last. We live in a haze of moments that will soon blow away into the reality of our true existence; to worship and honor God and enjoy Him forever. When Jesus returns, He will honor those who continued to exalt His word throughout their life. Pastors who persist in teaching through the entire Bible, verse by verse. People who read through the Bible; not in a cursory fashion as if they are reading a novel, but intently, purposely, meditating on every word that God has given. The Bible is not a set of books like other earthly publications. When we read through a novel or book written by worldly authors, we see the story, our imagination is filled with pictures of what is being described. The Bible is far different. It contains multiple layers. The deeper meaning cannot be known or understood by simply reading through the text two or three times. It is by a slow, methodical study, comparing one verse with other verses of scripture, thinking and meditating upon what God has said, that we begin to notice the supernatural construction of the text. I have studied the Bible for more than 40 years. I feel today, that I know far less than what can be known, although God has revealed a great deal to me already. What I have learned, is small compared to what remains. Throughout the ages of eternity, I will never fully understand all that the word of God contains. Only when Jesus comes before us and opens up His word to teach us, will we truly see the depth of wisdom that is contained within the pages of God’s word. As we approach the arrival of Jesus, people will increasingly grow indifferent towards the Bible. They will cease from church attendance where pastors teach the entire Bible. They will become more preoccupied with their own lives than they are with knowing God through His word and pleasing Him. Then Jesus will suddenly arrive and the majority of people who live upon our planet, will be taken by surprise. As we near the day of Jesus return, we should seek to honor the Word of God more and more—endeavoring to read it, meditate upon it, and understand what it is saying to us—above all the other pursuits of our life.